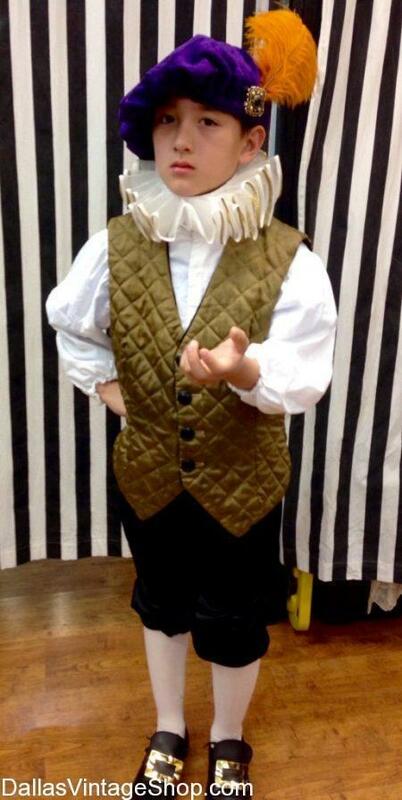 This Handsome Young Squire is just one of many Child Theatrical Costumes in stock. This Kids Squire Costume is one example of the thousands of Children’s Complete Outfits that are perfect for Child Theatrical Costumes. We have Dallas largest collection of Children’s Complete Outfits that are perfect for Child Theatrical Costumes. 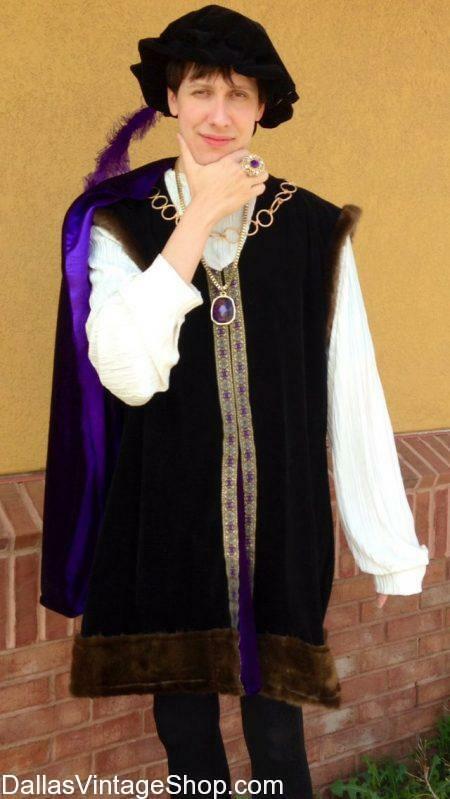 Here is one Handsome Young Squire Costume that you will find here. Just a look at our huge inventory of Theatrical Period Attire and you realize that this Children’s size outfit is just one amazing sample of our Child Theatrical Costumes. We have Kids Royalty, Kids Renaissance, Kids Medieval, Kids Shakespearean, Fantasy, Sci Fi, Broadway Productions, Biblical and any Historical Period Outfit including Kids Theatrical Costumes for any decade or any century. We are the Headquarters for the Dallas area Child Theatrical Costumes and Accessories. Find Child Renaissance and all Period Costume Accessories that are Period Correct that will turn your Kids Theatrical Production into an impressive masterpiece. Prices range from Supreme Quality to Median and Economy Costume Pieces or just the accessories you need. Posted in Children's Theatrical Costumes | Comments Off on This Handsome Young Squire is just one of many Child Theatrical Costumes in stock. This Martha Washington Colonial Period Costumes is just one example of the Child Theatrical Costumes you will find in stock all year round for Children’s Theatrical Productions and School Plays. We are the Dallas areas largest collection of Child Theatrical Costumes. 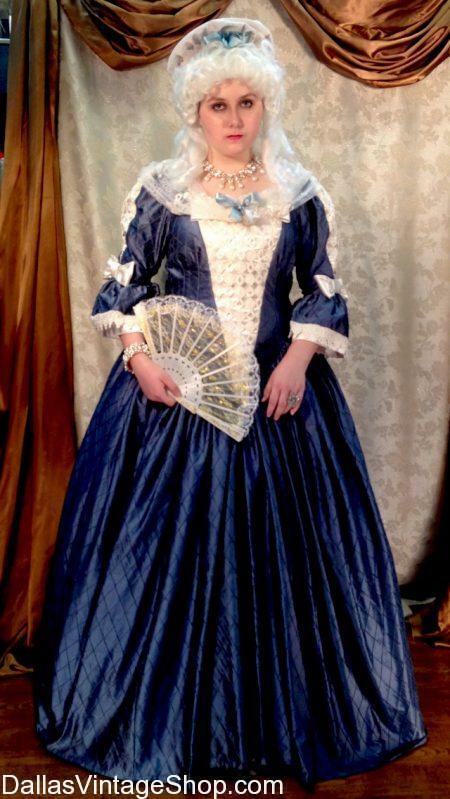 Dallas Vintage Shop offers this Martha Washington Stage Production Outfit and any Child Theatrical Costumes, Wardrobes, Makeup & Accessories you could possibly need. One of our Supreme Child Theatrical Costumes is this Martha Washington Colonial Period Costume. It is just one example of the Quality you may prefer for your Child Theatrical Costumes. In addition to this Supreme Quality Child Costume, you will be able to get Median Priced Costumes and Economy Costumes or just the Costume Pieces you need. We stay fully stocked all year round for Children’s Theatrical Productions and School Plays. When you need Child Theatrical Costumes for Children’s Broadway Reproductions, Historical School Plays and Kids Biblical Plays just remember that we have everything you need, all in one location. Children’s Quality Theatrical Guys & Dolls Costumes & Accessories. We have this precious Guys & Dolls Outfit for Children’s Theatrical Costumes. We are Dallas’ largest suppler for Children’s Plays, High School Broadway Reproductions and Quality Theatrical Period Attire and Accessories. This Guys and Dolls Costume is just one example of the Quality Child Theatrical Costumes you will find in stock all year round at Dallas Vintage Shop. Prices for Children’s Theatrical Productions and School Plays range from Supreme Quality to Median and Economy prices. Our Child Theatrical Costumes include everything you will need for Children’s Broadway Reproductions, Historical School Plays and Kids Biblical Plays. Find the full wardrobes, makeup and accessories for Children’s Theatrical all year round. Posted in Children's Theatrical Costumes, Guys and Dolls | Comments Off on Children’s Quality Theatrical Guys & Dolls Costumes & Accessories. Children’s Theatrical Attire is overflowing at Dallas Vintage Shop. This Henry VIII is just one of thousands of Youth & Children’s Theatrical Attire you will find in stock all year round. This Henry VIII Children’s Theatrical Attire is only one example of the Renaissance, Royalty Theatrical Costumes we keep in stock all year round. Get Crowns, Royalty Jewelry, Slippers, Wigs & Makeup too. Theatrical Costumes for Children range from Supreme Quality to Median and Economy Prices. We are the Dallas Area Top Provider of Children’s Theatrical Attire, Children’s Stage Makeup, Kids Historical Reenactment Costumes, Theatrical Wardrobes for H. S. Productions and all Theatrical Makeup and Period Clothing you need. Our Children’s Theatrical Department is the largest in the Dallas Metroplex. Just look at this Henry VIII Youth Theatrical Costume. It is just one of thousands of Youth & Children’s Theatrical Period Costumes you will find. Get Complete Theatrical Outfits for kids or Complete Kids Stage Production Wardrobes and all the Kids Theatrical Makeup, Wigs, Royalty Attire & Jewelry and everything you need all in one place. We have just about any Theatrical or Historical Character Costumes and Period Attire you can think of. We provide an unbelievable number of Children’s Historical Costumes like this School Theatrical Meriwether Lewis Explorer Outfit. People come from all over the DFW Area & Texas for Quality Child School History Project Costumes. Many of our regular shoppers are from all over the US and from outside of the US. Its worth the effort. 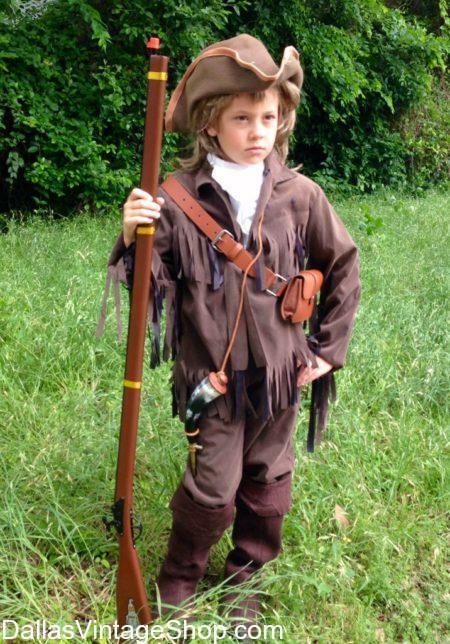 Children’s Theatrical and Historic Outfits include Children’s Theatrical Frontiersmen, Children’s Theatrical Pioneers & Children’s Theatrical Colonial Period Attire. Get complete Children’s Theatrical Wardrobes of just one costume or just the Costume pieces or accessories you need. Need Theatrical Costumes and Accessories for a Stage or Film Production. This Theatrical George Washington Statesman Costume is only one George Washington Costume Idea. We could go more Colonial or more Military or as General George Washington. We have any historical theatrical characters complete outfits or just the pieces you need. We have Children and High School Theatrical Attire too. Historical Pageant, John Adams, 2nd US President Costume: First US Vice President, Successful Boston Lawyer and Political Essay Writer, US Foreign Diplomat, Father of John Quincy Adams(6th US President), Member of 1st & 2nd Continental Congress, Revolutionary War Supporter, etc. We have all the Historical Period Attire you need for any Historic, TV Historic, Historical Movie, Theatrical, Political Holiday Parade or Theme Party Costumes. We have Child Civil War Costumes, Mary Todd Lincoln Children’s Costume, Child Civil War Era Costumes, Children Historical Costumes, Children’s Period Costumes Children, Children’s School Historical Costumes and we have Martha Washington Children’s Costume for School Projects and Patriotic Holidays. You are in Children’s Theatrical Costumes category.